Naga House was established to fill a need in the Mekong region for an impartial space for water resources management and governance where scholars, thinkers, development professionals, civil society and/or NGO workers could work in convivial surroundings. Naga House also serves as a repository of freely available information on programmatic activities, the development of water resources, and other relevant media. 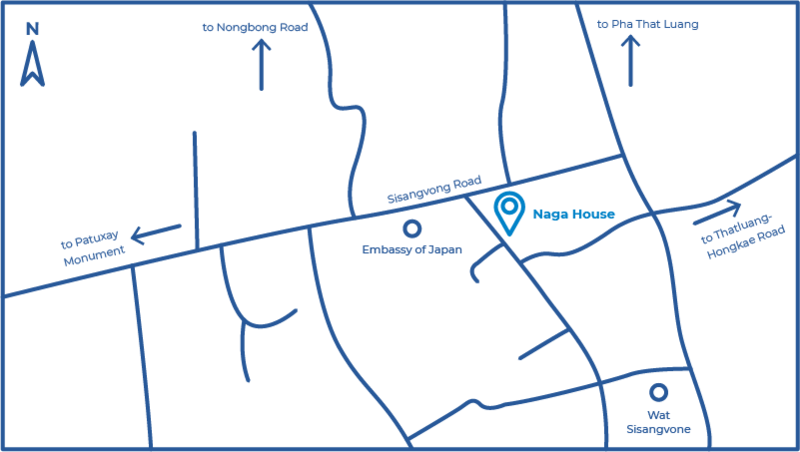 Naga House is located off Sisangvone Road, right near the Japanese Embassy near Sisangvone temple. Visitors coming up Sisangvone from Nongbone, will pass the Japanese Embassy to the right. Immediately after the embassy, turn right at the sign for Vayakhone School. Go straight, for about 50m and Naga house the second gate on the left. Naga House is a regional hub on research-for-development on water. If you would like to use this space, please contact us at wle-mekong@cgiar.org.